When you live full-time in a motorhome, no matter how big it is, there’s not a lot of room for extras. In order to have enough space to be comfortable, its necessary to strip your belongings down to the essentials. A library full of books gives way to e-readers and tablets. Full-sized anything? You’re gonna want to swap it out for a compact model or, better still, a version of it designed to collapse down to a smaller size to store when its not in use. My Montague Paratrooper Pro mountain bike does that. I love it. Bike designer David Montague put together the original Paratrooper folding mountain bike for the U.S. Military. It was designed to accompany parachutists out the door of a flying airplane and, once on the ground, be used to get the soldier riding it to an objective far more rapidly than if the approach were made on foot. I’d known about these bikes for years. I was obsessed with them. Moving into an RV gave me an excuse to finally get one: it’s a full-sized bike that collapses down small enough that I can stow it in one of our rig’s basement compartments, out of site and out of mind. The bike I ride, the Paratrooper Pro, comes with a few bells and whistles that the original Montague Paratrooper lacks. It’s front forks can be locked for riding on pavement in the city, or unlocked for a smooth, suspension-aided ride down trails and dirt roads. It’s got 27 gears to the OG Paratrooper’s 24. Its tires are only semi knobby, unlike the back country loving OG Paratrooper. This makes the Paratrooper Pro a little bit nicer for riding inside of the the city. And, over all, the Pro version of the bike weighs about a pound less. 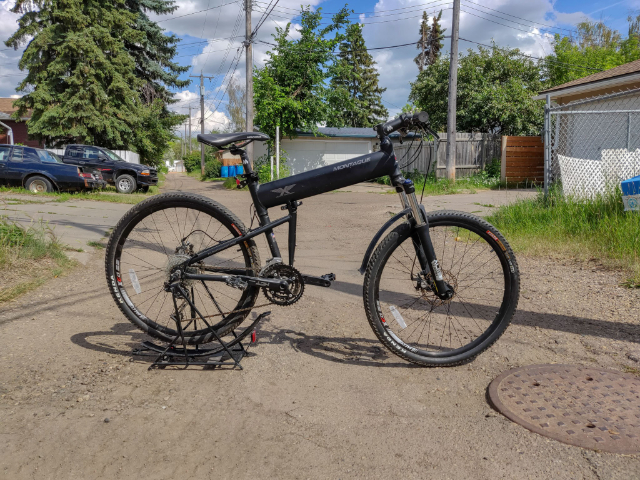 At 32 pounds, It’s an incredibly light bike. It’s shifters, disk breaks and the comfortably aggressive stance it forces you to take as you pedal your face off makes it a joy to ride. Did I mention that it comes in flat black? Flat black is the best color for a bike. It makes anyone riding it look like a competent badass. When I’m not riding my Montague for pleasure, it allows me to ride into town for groceries at times when my wife has our Jeep or scout out questionable roads to make sure that they’re fit to drive our RV on to. It’s an invaluable toy and tool. There’s just one thing that I’d change about my bike and its such a minor point that it scarcely needs to be mentioned: the trade off for it being so light is that the its frame is made out of aluminum. This is fine, mostly: It’s never shown any signs of fatigue from hauling my heavy carcass around. I’ve noticed, however, that after over a year of throwing it in our RV’s undercarriage and generally manhandling it, that it’s earned a few nicks in its frame that go a bit deeper than its paint job. That I’ve hauled it over a fair number of barbed wire fences while on rides in the country likely hasn’t helped this along, too. I’m fussy about my gear and like to take good care of it—the dings and gouges in my bike’s frame are a reminder that I’ve not always been as careful as I should be. I suspect a steel framed bike might not allow for such noticeable wear. And then there's its cargo rack. I love that it swings down so it can be used to keep the bike upright when its parked, or once its been folded away for storage. But I'm not a fan of the fact that, if you're using it to haul cargo with, you're forced to remove it before you can drop the rack down. I get around this by riding with a backpack, instead of using bike bags. But overall, this thing has been awesome. If you’re looking for a bicycle that can be folded up and tucked away behind your desk after your morning commute or live small like I do, you should check a Montague out. It’s one of of my favorite pieces of gear and I’m betting you’d dig it too.